When you watch the energetic kitten Amelie at play, you would never guess she is blind. (See video, below.) She hones in on the crinkle ball with the precision of a laser beam. She bops the ball, then dribbles it across the floor like a professional soccer player. Her best friend and teammate, Stevie, watches her slick moves from the sidelines. According to the Brooklyn Bridge Animal Welfare Coalition, "Stevie is Amelie's seeing eye cat." The two rescue cats, Amelie and Stevie, were raised together and are always playing and cuddling together. Amelie had such a bad eye infection when she was little that her eyes were removed. 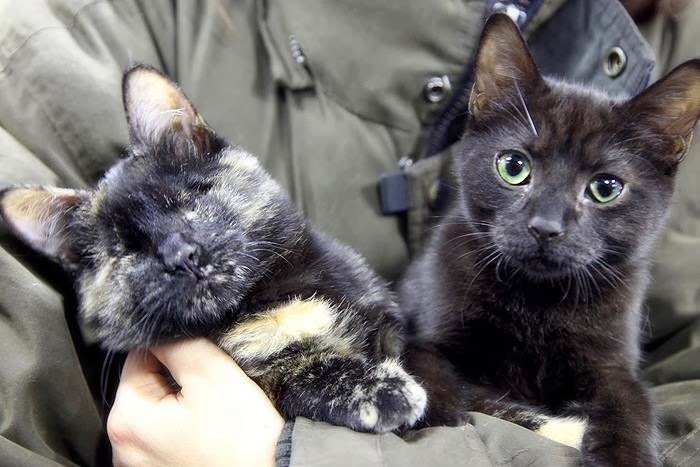 The blind kitten's sweet BFF cleaned her eyes for her after the procedure. The two kittens came from ACC when they were 4 weeks old. They are looking for their forever home and must be adopted as a pair. Amelie and Stevie are spayed/neutered, fully vaccinated, FIV/FeLV negative, and microchipped. Amelie will require no further follow-up regarding her prior surgery. If you are interested in adopting these sporty kitties, Please email BrooklynBridgeAnimals@yahoo.com to arrange a play date in their Brooklyn Heights foster home. Brooklyn Bridge Animal Welfare Coalition is a 501(c)3 volunteer group in Brooklyn, NY that fosters and promotes homeless cats and kittens, hosts adoption events, and finds forever homes! Take a look at their website, you are sure to fall in love with their lovely cats. What gorgeous kitties. So inspiring! I hope they get adopted soonest! Aww, I wish I could take them!